This is a stand in Philadelphia's Reading Terminal Market. They serve my favorite Philly Cheesesteak. My last day at my current job is Wednesday, March 2nd. Hopefully that day will be the last day I work in retail ever! 10 years has certainly been long enough. Training for my new job will be conducted in a suburb located less than 20 miles from my beloved Philadelphia! How fantastic is that?! I'll be away March 8th-10th. Sometime during that time, I hope to hop over to Philly and hang out with one of my old Art History friends still living there. (Though not for long! Currently at work on her PhD, she just won a fellowship to live in Greece from September to September. And like with me and Italy, there's a question if she's coming back or not!) 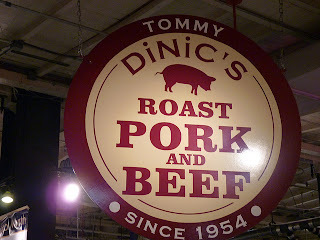 My favorite place in Philly is the Reading Terminal Market, so I always hope to go during a visit. I would love to visit the stand pictured for a cheesesteak! I was fortunate enough to visit Philadelphia four times last year. This will only be my first of 2011. The suburban town I'll be in (and have been to before multiple times) has a DSW so hopefully I can try on and pick up the pair of ballet flats I've been lusting after online to have for my trip to Italy. I need to make sure they're comfortable since I'll be on my feet all the time on my trip. ...because on April 16th, I'm going out to that charming Irish bar and highly-rated Italian restaurant in Annapolis I previously mentioned with friends. I invited my college room mate and her husband who live three hours away and I'm happy to announce that they are able to attend! I will invite the rest of my friends later this week since I've given myself a few days off in between jobs. On April 17th, I'm helping with an Italian feast to mark the occasion with my family. I have to decide on the menu... I think my dad's (meat) lasagna with my specialty pasta with vegetables, and maybe platters of antipasti? Prosciutto, cheese, roasted peppers, classic bruschetta, regular salad? Possibly sauteed spinach? Lots of wine... It can't be overly Italian for my very American family (also without a drop of Italian blood). Instead of tiramisu or something Italian for dessert, I can hardly wait to have chocolate cake topped with white buttercream frosting decorated with dark pink roses! Maybe I'll make them order it with "Auguri" written on top... That means "Wishes," short for "Tanti Auguri" or "Best Wishes" in Italian which is really what you say to wish someone a happy birthday. The DC Cherry Blossom Festival is March 26th through April 10th. My friend who I walk with every week and I are celebrating our birthdays (her's is mid-February and as you know mine's mid-April) there. We go to DC at least once a year and we love it at its most beautiful, when the trees are in bloom. We will go on a Sunday during that time (since I will soon no longer work or be on call that day of the week!). We're not sure if we wanna hit a certain museum or monument yet. I love me a birthday, something I'm quite known for! I leave for Italy on March 16th, which is just about 16 days away! I may have some exciting news regarding my trip, so stay tuned!